Recently, local farmers, small business operators, economic development executives and other community leaders convened in the Mississippi Delta to share their experiences around developing and growing businesses within the local and regional food economy. The forum, Delta Communities: Investment in Local Food in the Delta, was held in mid-November at the former Bank of Clarksdale building and was organized by the community development team at the Federal Reserve Bank of St. Louis. 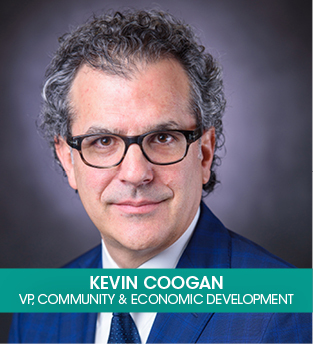 The event supported the bank’s goal of strengthening community and economic development throughout the Arkansas and Mississippi Delta region. The forum was an opportunity to raise awareness about food insecurity in the region while exploring solutions and strategies to promote the emerging food economy. HOPE was there to share information about its comprehensive community development approach, which includes programs to support healthy communities. For example, the Mid South Healthy Food Initiative (MSHFI) provides financing for fresh food retailers, primarily in areas with limited access to healthy food options. HOPE’s Small Towns Partnership, an initiative currently underway in a number of Mississippi Delta towns, provides economic development training and technical assistance for local leadership around projects that have been identified for their towns. A MSHFI project, the Up In Farms food hub based in Jackson, Mississippi, was highlighted during the Clarksdale event. Up In Farms is now a catalyst and vital link in the local food system chain. The operation supports small local farmers with crop production planning and technical assistance training. Additionally, the Mississippi-based enterprise has leveraged its relationship with a regional produce distributor to create a marketplace for farmers to sell year-round. As the core business grows and more farmers are able to participate, there is an opportunity to create other supporting businesses throughout the region like cold-storage and processing facilities. The number one industry in Mississippi is agriculture; yet, it is estimated that 90 percent of its food supply is imported from out of state. It is imperative to expand the local food system in the state and, along with it, the health and prosperity of its citizens. 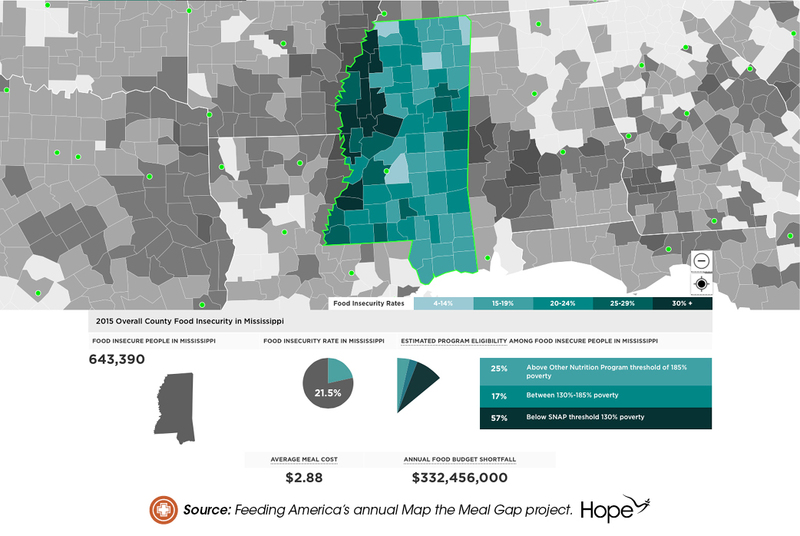 Feeding America’s annual Map the Meal Gap project illustrates that 11 of the most food insecure counties in the nation are concentrated in the persistently impoverished Mississippi Delta. See below. Food insecurity refers to a lack of access at all times to enough food for an active, healthy life but may reflect a household’s need to make trade-offs between important basic needs like housing or medical bills. The St. Louis Fed recently published “Harvesting Opportunity: The Power of Regional Food System Investments to Transform Communities.” The report focuses on regional food systems as a means for enhancing economic opportunity. Released in partnership with the United States Department of Agriculture (USDA), the publication compiles research, essays, and reports that highlight the important roles that financial institutions and policy efforts can play in supporting the development of regional food systems – and the subsequent economic and health benefits created in low- and moderate-income communities. The report was cited often during the Clarksdale meeting and is recommended reading for community development practitioners interested in promoting local food economies.